If you have any questions about the GALAPAGOS information page below please contact us. This important luxury yacht GALAPAGOS is a motor yacht. This 55 metre (180 ft) luxury yacht was constructed at Mitsubishi Heavy Industries in 1979. She could be considered a older converted private yacht. GALAPAGOS was previously registered as Tiara Ii; Taishu Maru. Superyacht GALAPAGOS is a beautiful yacht that can sleep up to 14 guests on board and has a total of 12 professional crew. 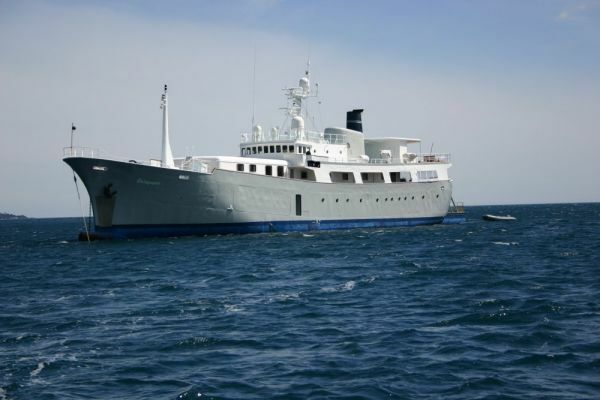 Motor yacht GALAPAGOS ex Tiara II and Ashu Maru is a private yacht, converted from a trawler. The yacht's wider design collaboration came from Mitsubishi Hi. The formal naval architect firm intellectual property are the products of Mitsubishi Hi. Japan is the country that Mitsubishi Heavy Industries built their new build motor yacht in. After the official launch in 1979 in Shimonoseki the boat was afterwards handed over to the owner following sea trials. The hull was crafted from steel. The motor yacht main superstructure is made extensively from steel. With a width of 9.05 m or 29.7 ft GALAPAGOS has spacious interior. A deep draught of 5.21m (17.1ft) limits the list of overall harbours she can visit, contingent on their specific characteristics. She had refit maintenance and modification carried out by 2001. This ship is powered with one efficient HANSHIN diesel engine(s) and can find a reasonable top end speed underway at 12 knots. The engine of the yacht creates 1300 horse power (or 957 kilowatts). Her total HP is 1300 HP and her total Kilowatts are 957. For propulsion GALAPAGOS has a single screw propeller. 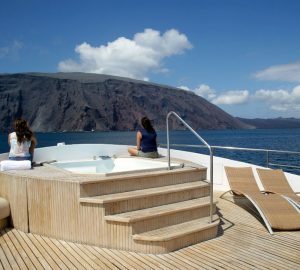 The important luxury yacht motor yacht GALAPAGOS is able to sleep a total of 14 guests and 12 crew. 54.86 metres / 180 feet. The propulsion comes from one 1300 HP or 957 Kilowatts Hanshin. Giving the combined power of 1300 HP /957 KW. Yanmar 2 times 250kva, Onan 1 times 118kva. She has a steel-teak deck. The luxury yacht GALAPAGOS displayed on this page is merely informational and she is not necessarily available for yacht charter or for sale, nor is she represented or marketed in anyway by CharterWorld. This web page and the superyacht information contained herein is not contractual. All yacht specifications and informations are displayed in good faith but CharterWorld does not warrant or assume any legal liability or responsibility for the current accuracy, completeness, validity, or usefulness of any superyacht information and/or images displayed. All boat information is subject to change without prior notice and may not be current.